Let us have a comparison between two major type of electrical measuring instruments they are moving coil (MC) and moving iron (MI) instruments.In this article all major differences between moving iron and moving coil instruments are discussed.When you go for viva or interview most often question on electrical measurements is what is the difference between mi and mc type instruments?.In this article you will get answer to all differences between MI & MC type instruments. 1. MC type instruments are more accurate. 1. MI type are less accurate than MC type. 2. Manufacturing cost is high. 2. Cheap in cost. 4. Very sensitive in construction & for input. 4. Robust in construction. 5. Low power consumption 5. Slightly high power consumption. 6. Eddy current damping is used. 6. Air friction damping is used. 9. Deflection proportional to current. ( θ α I ). 9. Deflection proportional to square of current. ( θ α I² ). springs,permanent magnet (i.e. No Hysteresis loss) 10. Errors are set due to hysteresis and stray fields. (i.e. hysteresis loss takes place). In this comparison between MC and MI Instruments we shared top points. In previous tutorial on Moving Iron Instrument Operation construction & working principle was discussed. In this post moving iron instrument torque equation will be derived. Consider a small increment in current supplied to the coil of the instrument. due to this current let dθ be the deflection under the deflecting torque Td. Due to such deflection, some mechanical work will be done. There will be a change in the energy stored i the magnetic field due to the change in inductance. This is because the vane tries to occupy the position of minimum reluctance. The inductance is inversely proportional to the reluctance of the magnetic circuit of coil. = I * dL/dt + T * dI/dt as both I and L are changing. The energy supplied in nothing but increase in stored energy plus the energy required for mechanical work done. Thus the deflection is proportional to the square of the current through the coil. And the instrument gives square law response. In our previous article we have discussed PMMC Instrument Working Opeartion. In this tutorial on Moving Iron Instrument Working Operation we go through the construction & basic principle of MI type instrument. Moving Iron Instrument Working Principle : The basic working principle of these instruments is very simple that a soft iron piece if brought near magnet gets attracted by the magnet. The construction of the attraction type moving iron instrument is shown in the below figure. lt consists of a fixed coil C and moving iron piece D. The oil is flat and has narrow slot like opening. The moving iron is a flat disc which is eccentrically mounted on the spindle. The spindle is supported between the jewel bearings. 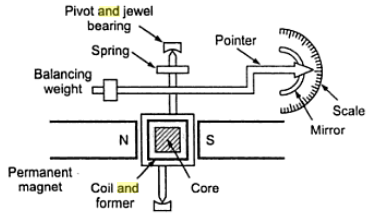 The spindle carries a pointer which moves over a graduated scale.The number of turns of the fixed coil are dependent on the range of the instrument. For passing large current through the coil only few turns are required. The controlling torque is provided by the springs but gravity control may also be used for vertically mounted panel type instruments. 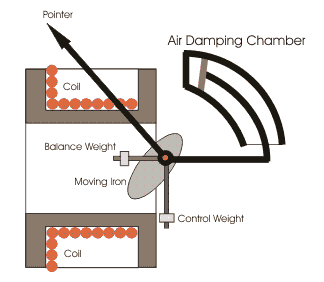 The damping torque is provided by the air friction. A light aluminium piston is attached to the moving system. it moves in a fixed chamber. The chamber is closed at one end. it can also be provided with the help of vane attached to the moving system. The operating magnetic field in moving iron instruments is very weak. Hence eddy current damping is not used since it requires a permanent magnet which would affect or distort the operating field.This is the reason Why why eddy current damping is not used in moving iron instrument. Moving iron repulsion Type instruments have two vanes inside the coil. the one is fixed and other is movable. When the current flows in the coil, both the vans are magnetized with like polarities induced on the same side. Hence due to the repulsion of like polarities, there is a force of repulsion between the two vanes causing the movement of the moving vane. The repulsion type instruments are the most commonly used instruments. Below shows the radial vane repulsion type instrument. Out of the other moving iron mechanisms, this is the moat sensitive and has most linear scale. The two vanes are radial strips of iron. The fixed vane is attached to the coil. The movable vane is attached to the spindle and suspended in the induction field of the coil. The needle of the instrument is attached to this vane. Even-though the current through the coil is alternating, there is always repulsion between the like poles of the fixed and the movable vane. Hence the deflection of the pointer is always in the same direction. The deflection is effectively proportional to the actual current and hence the scale is calibrated directly to read amperes or volts. The The calibration is accurate only for the frequency for which it is designed because the impedance is different for different frequencies. Figure shows the concentric vane repulsion type instrument. The instrument has two concentric vanes. One is attached to the coil frame rigidly while the other can rotate co-axially inside the stationary vane. Both the vanes are magnetized to the same polarity due to the current in the coil. Thus the movable vane rotates under the repulsive force. As the movable vane is attached to the pivoted shaft, the repulsion results in a rotation of the shaft. The pointer deflection is proportional to the current in the coil. The concentric vane type instrument is moderately sensitive and the deflection is proportional to the square of the current through coil. Thus the instrument said to have square low response. Thus the scale of the instrument is non-uniform in nature. Thus whatever may be the direction of the current in the coil, the deflection in the moving iron instruments is in the same direction. Hence moving iron instruments can be used for both a.c. and d.c. measurements. Due to square low response, the scale of the moving iron instrument is non-uniform.